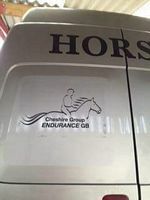 We now have very smart trailer/horse box stickers available at £15. The logo is on a clear background so it will suit any vehicle and the ‘easy peel’ will not leave a mess if you choose to remove the sticker. 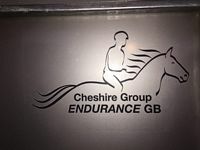 More details available on Cheshire.egb Facebook or, if you are not signed up to Facebook, contact Shaun direct at shaun@endurancegbcheshire.co.uk. 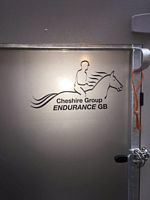 We now have fantastic fleece rugs available at £25 each sporting the Cheshire and EGB logos. If you would like a rug please let Pennie know the size you require. Photo shows ‘Mo’ modelling his Inter Regional Championships rug. 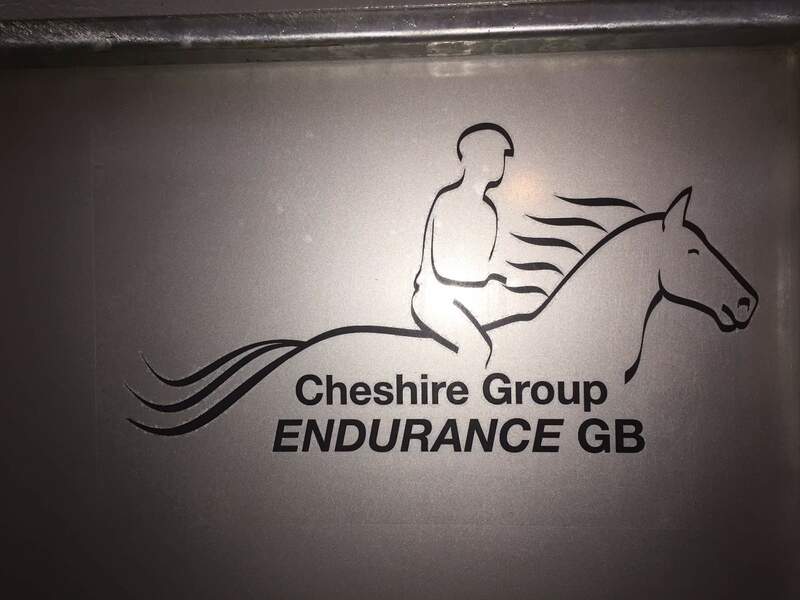 Cheshire EGB branded riding tights are now available in Navy Blue from Performance Equestrian. The tights are Perfeq water repellent and can be made to measure. The cost for basic tights (no padding with the Cheshire group logo) is £64.25. With knee or seat an extra £7.50 or £12.50 for both seat and knee. Carriage will be £5.30. 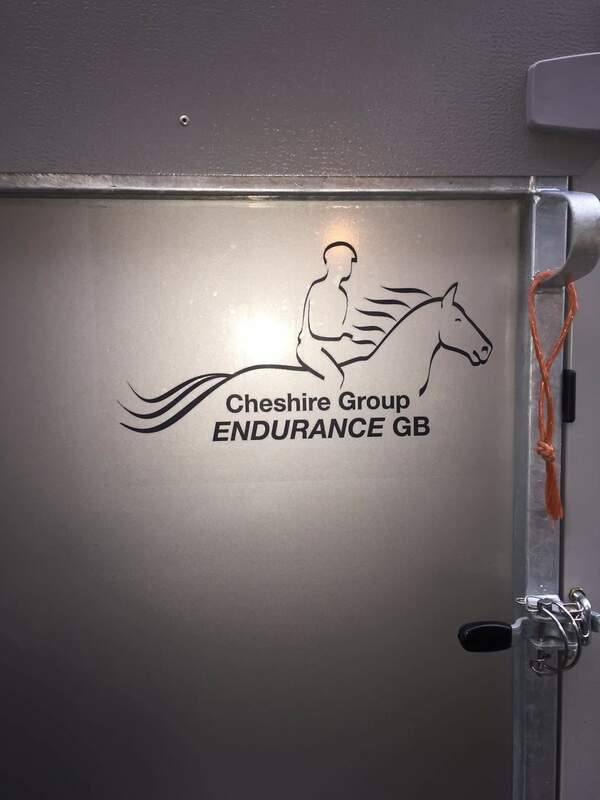 Please order direct from the Performance Equestrian website and add Cheshire Group Logo in the branding section. Please read the descriptions below noting the sizes available. Then send an email to Muriel by clicking here including a full description of what you want, your name and address. We will obtain the current price and email you with the cost giving you the chance to proceed or cancel. The prompt receipt of a cheque payable to "EGB Cheshire Group" would then be appreciated. All items are subject to availability and price changes from our suppliers. This softshell jacket in navy with Cheshire Group EGB logo in gold has an interchangeable collar system, shaped panels for fitted styling and hip adjusting side zips. The 3 layer, waterproof, soft, high stretch fabric is lined with microfleece for extra warmth. The jacket has a comfortable active cut. Shaped panels for fitted styling. YKK full front zip fastening. 2 zip closing side pockets with stitch feature, 1 zip closing sleeve pocket and 1 inside phone pocket. Decorative front and back yoke. Body: 320gsm 3 layer waterproof 8,000mm bonded fabric. Outer-layer: 93% Polyester, 7% Elastane. Mid-layer: TPU waterproof, breathable 1000g and windproof membrane. Inner-layer: Microfleece for extra warmth. PRICE: To be ascertained at time of order. This softshell jacket in navy with Cheshire Group EGB logo in gold has soft high stretch fabric lined with microfleece for extra warmth. It has a comfortable active cut and shaped longer back panel. YKK full front zip fastening. 2 zip closing side pockets, 1 zip closing chest pocket, 2 large inside pocket and 1 inside phone pocket. Adjustable shockcord hem. Inner storm flap. Decorative front and back yoke. Waterproof and breathable fabric. Inner storm flap. Outer Layer: 93% Polyester, 7% Elastane. Mid-Layer: TPU waterproof, breathable and windproof membrane. Inner: Microfleece for extra warmth. This pro-style heavy brushed 100% cotton cap comes in navy with Cheshire Group EGB logo in gold. One size cap has a self fabric strap with tri-glide buckle.